Bangladesh Launched Mobile Games ‘Bigganer Rajje’ 2018. Recently has been launched new mobile games of Bigganer Rajje. Its games is available in Google playstore and Bigganer Rajje website. On this time authority has been launched Bigganer Rajje for class 6-8 and class 6 to 10. The first science-based educational game in Bangladesh is made by the Curriculum and Textbook Board of Bangladesh. Name of the game title ‘Bigganer Rajje’ (in the state of science). It is inaugurated by Professor Dr. Jafar Iqbal and NCTB’s Director on 17 February 2018. The game has been created by game Maker company named “Dream 71”. The game was unveiled on February 17, 2018 at Capital’s Bangla Academy premises. Three Educational project was inaugurated on that day by the Education Ministry and the Access to Information (A2I) program of the Prime Minister’s Office at Ekushey Book Fair. Rashed Kabir, Chief Executive of ‘Dream 71’ said students can learn science while playing this game. We are hopeful about the success of the game. It will be successful. The game is made for the students of class six, seven and eight for Making science education more easy and animated for the students. Although compiled in the light of the syllabus, the content of the syllabus has been presented in a different fashion in this game by game fikation. The content of the game has been very attractive with different characters, objects, scenes, backgrounds, visual effects, and audio effects. In the state of science, the game will provide an unlimited joy to the students. On the other hand, education will also become a unique ingredient. Rashad Kabir also said, if you complete one step of the game, the students can go to the next step. In this way, by continuously completing various steps, they can go deeper into the contents. Know about the various aspects of science in the game. Through the game, students can easily master the complexity of science from complex riddles. Students will also get ideas about the application of education and practical education. This game has been developed for students of class VI, VIII and VIII. The app can be downloaded from the Android Play Store and the Apple App Store. Professor Mohammad Zafar Iqbal of Shahjalal Science and Technology University was present at the inauguration of the seminar. At the ceremony, he said, ‘Our primary job is to teach children that you read books. Policy Adviser Anir Chowdhury of the A2I program answered the questions of the students and guardians about the education system. The other two programs that inaugurated in the program are “Aggregated Reality Based Education” for students of pre-primary and special needs and animated content for students of class eight, nine and ten title ‘Hater muthei Biggan’ (science at hand). You can download the games from google play store at eam71.bigganerRajjeClass. For more update about science, information & technological news, likes our page. 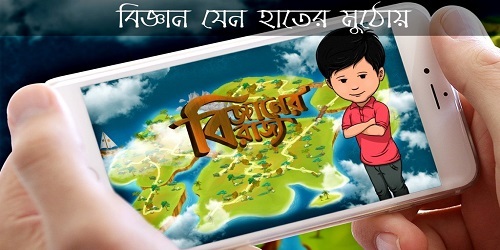 Write yours comments and share our news of Bangladesh Launched Mobile Games ‘Bigganer Rajje’.